Nia Jax Challenges Ronda Rousey to a Match: "I Will Happily Oblige"
Nia Jax Challenges Ronda Rousey to a WWE Match! While at the 2018 NBCUniversal Upfront, Nia Jax took the opportunity to challenge Ronda Rouseyto a match at the upcoming Money in the Bank WWE event in June. 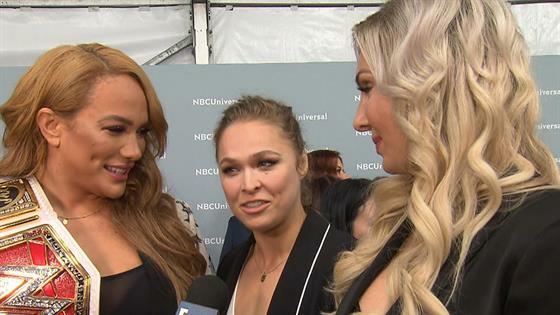 "We are very civil and professional ladies, so Nia did just challenge me for Money in the Bank to come after her title," Rousey told E! News on the red carpet. "I happily oblige respectfully, so I can sit next to her." While they appeared cordial as they gave a joint interview, Jax noted, "We can still get along for now, but once we get in the ring, it's over. All bets are off, right?" "We're professionals, so when we get in there, there's a job to be done," Rousey added. "When we're outside of the ring, then we can still be respectful to each other. We all have the same goals. We're all trying to lift the women's division and to show people that we have more to offer than they've given us credit for in the past." So, how is the Raw Women's Champion going to prepare for their upcoming face-off? "I've never been in a ring with somebody like Ronda," Jax told E! News. "She's one of a kind, so there definitely has to be an alternation to my regimen and I'm looking forward to it."